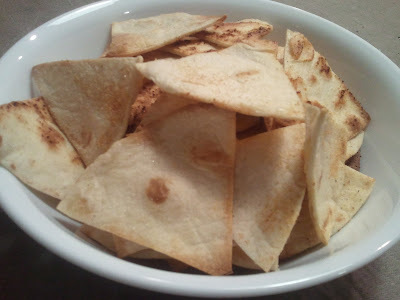 It's so easy to make baked tortilla chips! They're so good when they are fresh and hot! And they don't go stale because they're all gone soon after you make them. Plus, they are inexpensive, assuming you have a cheap source of tortillas. I get mine at ALDI - they sell a 20 ct bag for $1.99. Or check your local warehouse store if you will use a large number of tortillas in a short amount of time. Or watch for a BOGO sale at your local supermarket. And you can make them in whatever flavors you want. I used salt and garlic powder, but you could use pepper, paprika, chili powder, or any other spice you'd like to try. Cheese powder from a box of macaroni & cheese would work, too! Or you could make them sweet - use sugar and cinnamon. The possibilities are endless! Preheat the oven to 400 degrees. Spray the front and backs of the tortillas with the oil spray. Cut tortillas into eighths. Place tortilla triangles on a baking sheet. Sprinkle salt and garlic powder over the triangles. Turn the triangles over and sprinkle with more salt and garlic powder. Bake at 400 degrees for 5-7 minutes, or until the edges turn brown. Keep a close eye on the chips as they may cook quicker, depending on your oven. Allow to cool... a little... then munch! 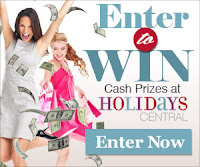 If you want a great frugal gift for your friends check out my link! I do the tortilla chips with spread with melted butter and pastry brush and sprinkle with cinnamon and sugar or sprinkle with Popcorn cheese flavoring. I can create a bag of chips for about .30 instead of paying close to $4.00 for a bag of predone chips. Make great dips and you will find the family does not even miss store bought chips. Yum! I have made these before with cinnamon sugar - I love the crispiness. Baked Tortilla Chips are awesome! Plus, look at all the goodies that can be put on them, in case any of them last long enough -- salsa, bean dip, hummus, peanut butter, Nutella...we'd love to have some here! I've linked a recipe for Spiced Cranberry Pear Sauce to go with a holiday dinner. I hope you're having a great week! Sounds easy enough. Do they keep well? Lulu, I have no idea! We always eat them right after they've been made. My guess is no, though, since they don't have the kind of preservatives that tortilla chips would have. Sounds yummy! We used to do that in the days before we became gluten-free. The memorie make my mouth water. Your Baked Tortilla Chips sound so delicious, and I love how you can switch up the spices for variety! We love homemade tortilla chips! Thank you for sharing at All my Bloggy Friends. Wishing you a Happy New Year!